There were plenty of stories to be found within the second GABS Hottest 100 Kiwi Beers countdown, from Panhead holding on to top spot to Garage Project supplying almost one in five of the beers and Liberty claiming the highest new entry. But, given we spoke to the first of those when they topped the poll last year, and with Garage Project people variously gallivanting around Europe or crook at the weekend, not to mention Our Man In NZ planning a trip to Auckland soon to – among various other things – catch up with Joseph Wood from Liberty, we decided to look elsewhere. Instead, Jono spoke to comedian Leigh Hart after his Wakachangi Lager, brewed at McCashin's, almost crashed the top ten, to Andrew Childs at Behemoth (Chur in Australia), after he registered 14 beers in the list, and to Søren Eriksen of 8 Wired, who not only saw his beers make up 10 percent of the poll but also led the way for the ten beers in the 100 that fit somewhere within the increasingly broad church of sour beers. You are never quite sure if what comes out of Leigh Hart’s mouth is fact, fiction, or a stew of the two. It possibly comes with the territory. While Hart is a fan of good beer, he is better known as a comedian, radio jock, inventor of low-budget, high-laugh television shows such as fishing mockumentary Screaming Reels, and member of the Alternative Cricket Commentary Collective – possibly the crudest, yet most accurate, cricket commentary team ever assembled. On one of those television shows, Moon TV, he came up with a series of ridiculous names to describe the Waikato River just outside of Hamilton: the Wakatumba, the WakaChangChang, The Ol’ Misty. But one has stuck harder than most – Wakachangi. The story of how a nickname for a river became a beer is, frankly, unbelievable, unless you hear it in Leigh Hart’s gravely straight delivery. Then it seems believable enough to go on the front page of the New York Times. It all started when he thought about getting into the beer game. Except it goes back far further. He went through the family archives and found his great uncle Kenny had been a brewer and written down a beer recipe. That recipe, according to folklore, had its origins with a group of druids involved in the building of Stonehenge – “A lot of people think that’s why Stonehenge never got finished in the end, because they were drinking the beer,” Leigh says – who got into trouble with the pope at the time, who wanted to confiscate the recipe. The recipe was split into four and sent to different parts of the world to keep it safe. Two parts were found quickly, one lost to the annals of time, while the third surfaced with great uncle Kenny in Greymouth, New Zealand. He put the three known parts together, made up the rest, and created the recipe for Wakachangi. “We don’t know how much of this is true,” Leigh says. But what is true is how popular the beer has become. A nationwide launch tour packed bottle stores, while the 12-packs can now be found in supermarkets and dairies across New Zealand. People can even download the Wakachangi GO app, inspired by the success of Pokemon GO, which directs fans to the nearest stockist. Leigh says the app has been a valuable source of data, enabling him to see where people are seeking out the beer. He can then go in, meet store owners, see how the beer is going and figure out where it needs pushing. His unique style of marketing extends to the distinctive packaging. Inspired by old movie posters, Wakachangi will be launched as a slab in Australia in the next few months. While the 12-pack comes with a cut-out coaster, the slab will have an all-access pass to every event in the world. 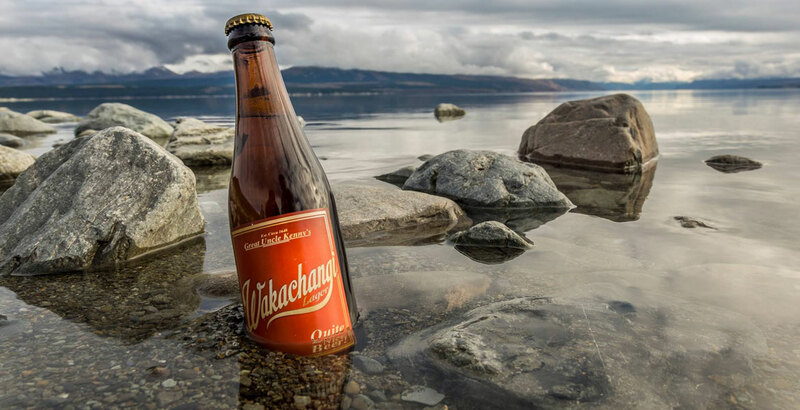 While initially brewed out of Harrington’s Breweries in Christchurch, Wakachangi is now made at McCashin’s in Stoke. 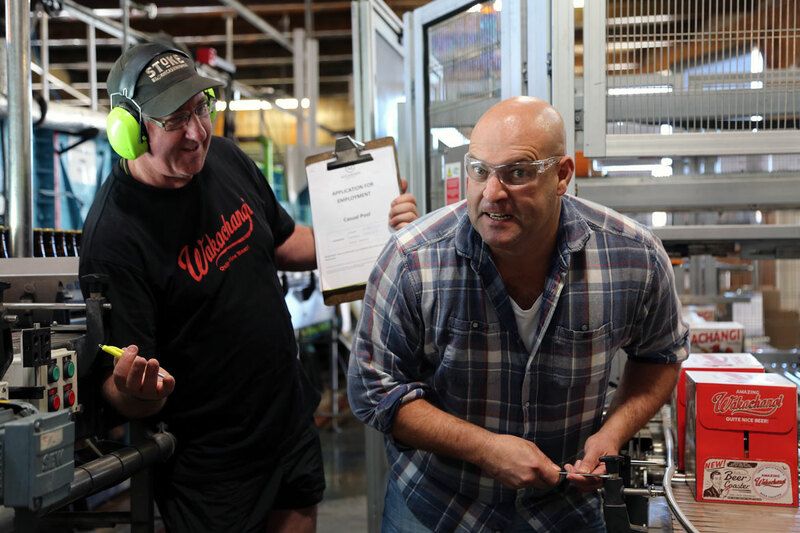 There are also plans to expand the Wakachangi range, although Leigh is likely to go for a vodka or a bourbon, dubbed with another of his nicknames for the Waikato river, instead of another kind of beer. While Australians, at least within the craft beer bubble, have been embracing sour beer styles in the past few years, just a pair made this year's GABS Hottest 100. It was a different story across The Ditch, however, with New Zealand breweries manage to fit ten into their Hottest 100. Warkworth’s 8 Wired contributed half that number, with its Cucumber Hippy Berliner making it to the top 10 amid a contribution that ranges from a sour black IPA (Cosmic Chaos) to a barrel aged sour ale with added cherries (Fistful of Cherries). 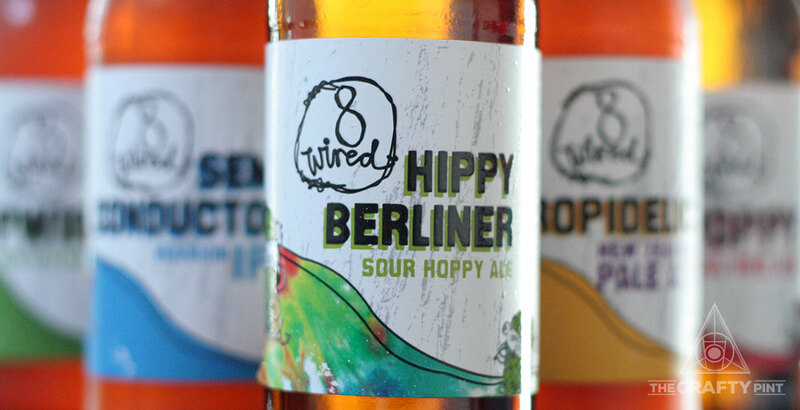 The brewery’s Hippy Berliner – a heavily hopped 4 percent ABV Berliner Weisse – was also New Zealand’s first sour beer to make it into six packs. 8 Wired founder Søren Eriksen says brewing sour beers was a natural step in the brewery’s journey. He first started creating barrel aged beers while still contract brewing out of Blenheim’s Renaissance Brewery, but started getting into kettle sours when he moved to his own facility in 2014. “The plan was to try create some that we can make quickly, cheaper, cleaner and more accessible to people,” he says. That, combined with the brewery’s penchant for heavily hopped, yet still balanced, beers led to Hippy Berliner. Søren has gone on to make almost ten variations of Hippy Berliner, adding ingredients as varied as cascara (the dried skin of the coffee cherry) and rosewater. But it is the cucumber that's hit a chord with beer drinkers, including Soren: “It’s very refreshing and quaffable, a very easy-drinking beer,” he says. While kettle sours can be and quick and easy way for breweries to add a sour beer to their range – no barrels, no ageing time, almost no risk of infecting the brewery – Soren says he still loves barrel aged sour beers. “Making a kettle sour is easy and quick, but it’s not quite as romantic," he says. "It’s like pilsner compared to double IPA. Most breweries seem content to release a few new beers a year, perhaps with a couple collaborations thrown in. But Behemoth founder Andrew Childs doesn't work like that. He considers two months without a beer launch as quiet. Is being prolific down to an eternal font of creativity? A desire to innovate? Wanting to stay one step ahead of everyone? It's that constant flow of ideas (or is it a constant state of procrastination?) that has seen Andrew end up with 14 beers (one of them a collaboration) in the Hottest 100, second only to Garage Project, who seem to release a new beer every time the wind blows in Wellington. While Garage Project enjoys the benefit of its own brewery, only recently shifting some production to bStudio in Napier, Behemoth – which trades as Chur in Australia due to a trademark clash with Where Strides the Behemoth by KAIJU! – has contract brewed from as many as three different places, sometimes in both the North and South Islands. Andrew laughs when asked how much of his time is taken up by logistics – “It’s about three-quarters of what I do” – and says being a contract brewer comes with challenges unique from those who own their own breweries. Cutting down on new releases would help with the logistics, but Andrew is unlikely to compromise there. He is also keen to stick to his rip lid cans, where the whole top comes off the can instead of just making a small hole, despite them costing far more than a conventional can. The next year is a big one for Andrew and Behemoth. A long-time dream to open a brewpub, which will feature charcuterie from his wife Hannah, is making progress. Then there are plans to make a bigger push into Australia. And, no doubt, more new releases than you can shake a stick at. You can find more Hottest 100 coverage here and on the GABS website. 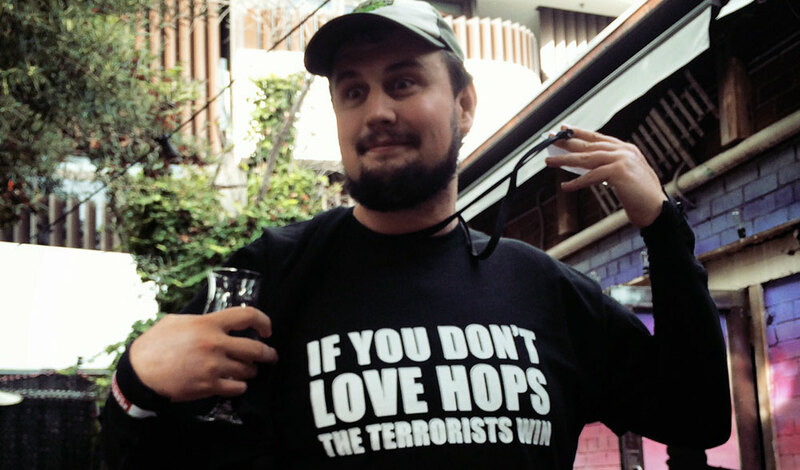 And you can check out our coverage of the NZ beer scene here. Thanks to Jono Galuszka for the above interviews, the shots from the winners' circle and assistance with the other H100 article. You can find him elsewhere on the internet on Twitter, or his beer blog From Drinker to Brewer, which you can also follow on Facebook.